This groundbreaking book explores the history and the cultural context of family claims to power in the Bamako kafu, or state (located in contemporary Mali in West Africa), primarily during the eighteenth and nineteenth centuries. Perinbam argues that the absence of precise information on the Bamako kafu's political status during this period empowered families to manipulate the myths, rituals, and ancestral legends?as well as belief systems?so that their claims to state power appeared incontrovertible. The French, on reaching the region, accepted these representations of power.Although the author's historical data focus mainly on the eighteenth and nineteenth centuries, mythical recountings beyond this historical grid?ranging across approximately one thousand years and including large-scale migrations throughout the West African Sahel?provide insights into the processes by which many of these ethnic identities were subject to reconfiguration and reinvention. Within this historical-mythical matrix, Perinbam offers new insights into the reconstruction of Mande identities, their cultures (material and otherwise), political systems, and various social fields, as well as their past. Instead of rigid ethnic identities?sometimes identified in the historical and anthropological literature as ?Mandingo,? ?Malinke,? or ?Bambara? ?the author argues that variable ethnographic identities were more often than not mediated in accordance with a number of mythic and historical contingencies, most notably the respective states into which the families were drawn, as well as state formation, maintenance, and renewal, not to mention meaning sensitive to political, generational, and gender challenges. 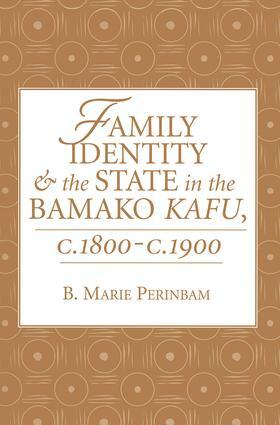 With the arrival of the French in the late nineteenth century and the Mande incorporation into the French colonial state, familial identities once more readjusted.The careful research and original scholarship of Family Identity and the State in the Bamako Kafu make it a significant contribution to the histories of West Africa, the African Diaspora, and the United States.